We love sesame seed oil because it’s not only full of heart healthy fats (monounsaturated and polyunsaturated) and vitamin E, it’s also a good source of vitamin K and traces of magnesium, calcium, copper, iron, and zinc. Thus, sesame seed oil may help lower blood pressure, balance cholesterol, and provide anti-inflammatory and other antioxidant benefits. Additionally, sesame seed oil has often been used in holistic healing because of its known antibacterial, antiviral, and anti-fungal benefits. Lastly, this oil also acts as a diuretic and can help flush out extra sodium and toxins. We give it two thumbs up! provides anti-inflammatory, heart, skin, antibacterial, antiviral, antifungal, & diuretic benefits, & may help lower blood pressure & balance cholesterol. Sesame seeds are thought to be the first crop harvested and used for oil and as a condiment. Known for the unique combination of sweet and acidic, rice vinegar has a mild flavor relative to other vinegars and is most commonly used in Asian-style dishes. A zero-calorie condiment, rice vinegar can save calories while adding flavor to the food you already love. Not only does rice vinegar add flavor, but it also is sodium-free. We highly recommend this for more than just Eastern-inspired dishes! May help reduce the risk of cancer, heart disease, diabetes, and osteoporosis. Let’s start out by saying, olive oil is one of the best culinary oils for our heart health! Specifically, olive oil’s phytonutrients have anti-inflammatory and antioxidant properties, while its fatty acid content (like omega-9 & omega-3) is great for proper balance of total cholesterol and lowering blood pressure. But that’s not all, olive oil is also packed with other great antioxidants, including, but not limited to, vitamin E and beta-carotene. Lastly, as a side note… we use extra virgin olive oil. Why? Because extra virgin means it’s from the first press (cold-press) of the olives, making it the most flavorful and the most nutrient-dense kind of olive oil. Olive oil should be kept in a dark place, like your pantry, to keep all the nutrients intact. Also, don't ever store in the fridge – condensation can cause it to spoil. Native to Italy, balsamic vinegar begins as grapes which are then aged and fermented in wooden barrels. Very low in calories, it contains polyphenols – antioxidants that can protect the body from heart disease and cancer. A natural immune booster, the grapes that are used to make balsamic vinegar contain antioxidants that fight against cell damage, improve the body’s immune system and make blood platelets more flexible. Contains low sodium and cholesterol, improves immunity, improves blood circulation, regulates blood sugar levels, aids in digestion, and is rich in antioxidants. 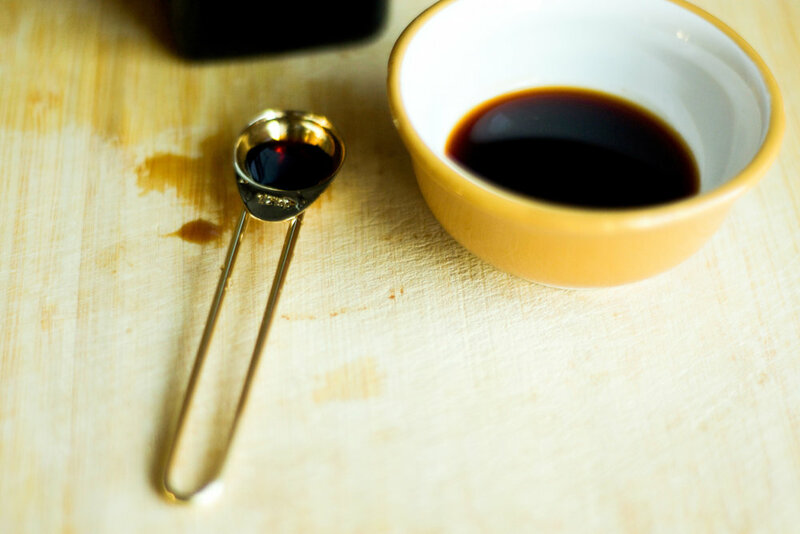 In ancient Italy, balsamic vinegar was used as a pain reliever! Talk about delicious medication. Tamari = wheat-free Japanese soy sauce. Tamari may actually have more phytonutrient antioxidants than red wine and contain a greater protein density than animal products. Tarmai also supports digestive health by promoting the growth of good bacteria in our large intestine thanks to the larger concentrations of oligosaccharides from the fermentation process. What a great condiment! Tamari has a larger protein density than some animal products and whole soybeans. Tahini, the paste made from ground sesame seeds, is rich in many nutrients, such as heart healthy fats, copper, manganese, magnesium, phosphorus, iron, vitamin E, B-complex vitamins, zinc, & protein. Actually, Tahini is 20% complete protein, making a better protein source than some nut butters! It’s also a surprisingly good source of methionine (which aids in liver cleansing) and is one of the best sources of calcium out there! Plus, did we mention it tastes delicious and easy to digest?!?! We recommend unhulled tahini as it's made from the whole sesame seed, making it more nutrient-dense. This condiment gets 5 stars! Dijon Mustard… a great condiment and a great addition to salad dressings, may be more than just that! Dijon mustard is another ingredient on our list that’s rich in the strong detoxifying phytonutrients, GLUCOSINOLATES - not to mention, mustard seeds also contain myrosinase enzyme, which break down the glucosinolates into their true detoxifying form, isothiocyanates. Isothiocyanates are amazing at toxin conjugation and toxin elimination! Clean eating made easy! Dijon mustard was created in 1856 when Jean Naigeon replaced the vinegar in traditional mustard with verjuice (juice from unripe grapes), creating a smoother, less bitter mustard. Coconut oil - either feared or embraced. Are you afraid of coconut oil; more specifically, are you fearful of the fat? Well, we’re here to shed some light on why coconut oil should be celebrated by the masses. Yes, coconut oil is high in saturated fat, making it solid at room temperature; BUT, it’s primarily made up of medium-chain fatty acids, as opposed to long-chain fatty acids, like other oils. Medium-chain fatty acids are easily recognized and broken down by the body, they are burned off as energy faster and aid in weight loss, plus they are great for the skin. But, that’s not all, coconut oil also has antimicrobial, antiviral, and antifungal properties. In other words, coconut oil isn’t just great at giving you a fantastic & natural energy boost, it’s also very versatile - can you say, “coconut oil face masks! supplies easily digestible fats, provides a great & natural energy boost, aids in weight loss, contributes great skin benefits, may help increase "HDL" or good cholesterol levels in the blood, and supplies antimicrobial, antiviral & antifungal properties. Coconut oil is good for both cooking and baking due to its high heat index (it’s a great natural plant-based substitute for eggs &/or butter). Apple cider vinegar, or ACV, is one of the newer health trends hitting the market, and with good reason. Many have taken up the ritual of a morning ACV shot in order to aid in weight loss, heighten energy, reduce heartburn, boost the immune system, support healthy pH balance, and promote great digestion. But that's not all; it's also great when used topically to beautify hair, skin, and teeth. It seems that ACV is more than just a great salad dressing - so move over balsamic vinegar, apple cider vinegar is the new sheriff in town. Apple cider vinegar taken by the tablespoon or mixed in with warm water or apple juice can help relieve and soothe dry, sore throats AND may also help cure those pesky hiccups.